The team of National People’s Party (NPP ), left for New Delhi to attend the party’s Central Executive meeting, informed a press release issued by NPP spokesman Nima Sangey Saling. 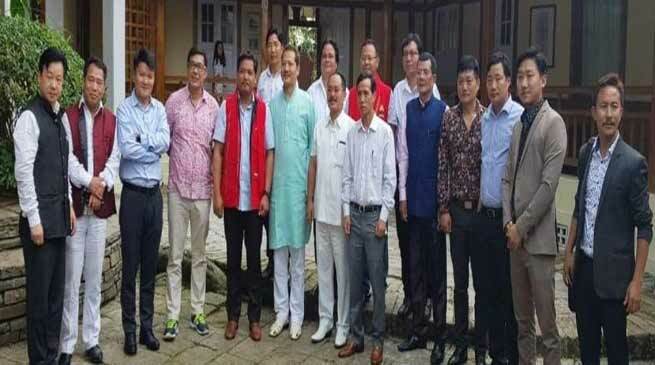 Gicho Kabak State President of National People’s Party (NPP) Arunachal Pradesh alongwith 7 (Seven) MLAs namely Tanga Byaling, Rajesh Tacho, Tapang Taloh, Tirong Aboh, Mutchu Mithi, Dikto Yikar and State office bearer of NPP Anok Wangsa (former Minister) Vice-President, Nima Sangey Vice-President & Spokesperson and Porchu Tamin General Secretary State NPP left for New Delhi to attend the Central Executive Committee Meeting of National People’s Party (NPP) to be held on 21st July 2018 in New Delhi. The Central Executive Committee Meeting will be presided by the National President of NPP & Hon’ble Chief Minister of Meghalaya Conrad K Sangma.